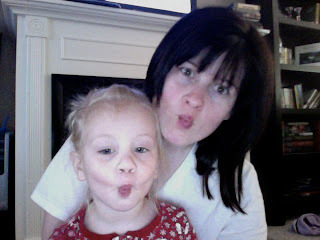 I am getting a day off from school today to stay home with Annie Poo (she still has a little pink eye.) 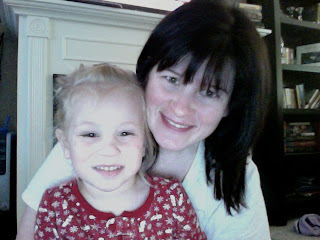 We are up at 7am watching Curious George and eating peanut butter and jelly waffles...YUM!!! I am hoping that this little girl will allow me to be productive today...Michael washed ALL the laundry yesterday when he was home, but didn't fold or put any away. 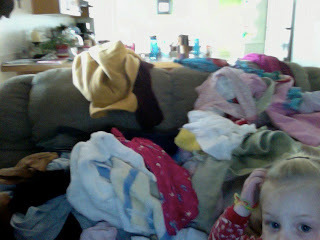 Needless to say there is a mountain of laundry... I also would love to get some crafting done during Anne's nap! 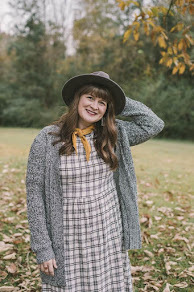 I have so much I want to do--and can't wait to ry out my new space!!! As you can see, her eyes do look much better this morning...I AM SOOOO THANKFUL!!! 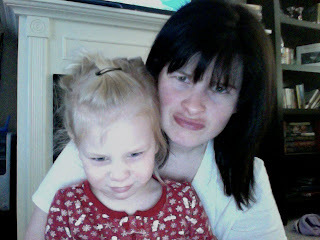 last picture=priceless.. hahah... hope that kiddo is feeling better! we've got our own private dining room at lee's we've got to try out this week! YES!!! I cannot wait to see!